Photographed outside the Bowls Club in 1937. 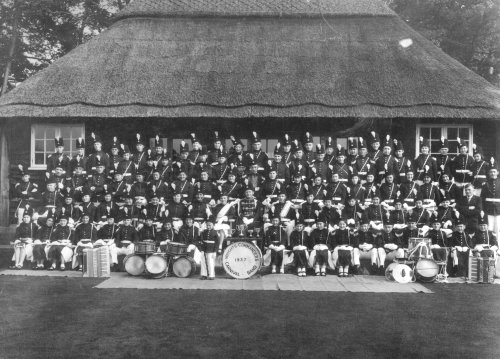 It is believed that the band started in 1936. John Rudkin remembers the Wright's Commanders marching band, as both of his parents played in the band in the 1950s. Ivy Rudkin played a kazoo and her husband Jack, played a snare/side drum. John remembers that the band was unusual in that they had lights in their uniforms for giving night time displays! The bandmaster at that time was Arthur Wheldon. "My Nan was in the showband pre-war. She remembers Lil Talbot, Arthur Wheldon, who was band leader and Jack Newton, who she thinks was the mace bearer. My Nan would have been Joyce Gimson at the time and remembers having the lights on her uniform and practicing in fields doing union jacks etc. She played the Kazoo, a large brass one apparently and remembers the red and white uniform. she thinks there were at least two other bands in loughborough at the time and a thriving competition circuit. We think she is 5th from the left (the first two be between the back two rows) on the big photo at artefact 281"